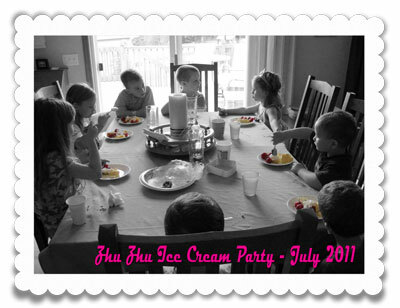 We beat the heat in July by hosting our very own ice cream social! 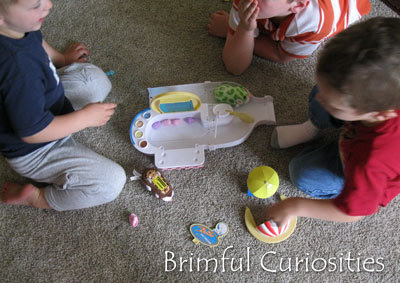 A few weeks back we invited our playgroup friends over for a special ZhuZhu Pets themed party and the kids got a chance to play with two new and cool toys in the ZhuZhu pet line: ZhuZhu Pets Ice Cream Parlor and ZhuZhu Pets Ice Cream Truck. 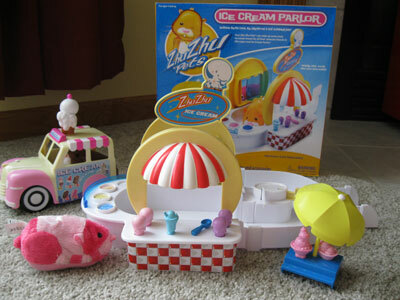 The ZhuZhu Pets Ice Cream Parlor playset reminds me of a retro ice cream shop. The parlor itself is pretty darn cute with a sliding drive through window on one side, a fancy red/white awning with sign attached to a checkered serving counter on the other side and a rounded bar in between. The set includes the following ice cream accessories: 7 Ice Cream Treats, 4 double-sided flavor ice cream tubs, and an ice cream scoop. The set also includes a picnic table and umbrella as well as connector pieces so you can attach it to other ZhuZhu Pets sets. 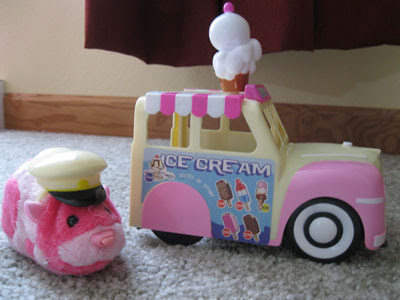 When a ZhuZhu pet drives over the track bumps in the drive-thru or inside the parlor, it responds. For instance, when it goes through the drive-thru lane it stops and makes noises that sound like someone placing an ice-cream order. Our party pack also came with four brightly colored ZhuZhu Pets: Motley, Harlow, Kacee and Bitsy. (Just enough pets so that each family could take one hamster home.) 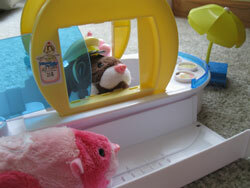 It was certainly a lively party with all those hamsters driving around the house, chirping loudly! Of course it wouldn't be much of an ice cream social without some ice cream! We ended our party with extra-large helpings of strawberry shortcake topped with ice cream and whipped cream - YUM! Many thanks to MomSelect MommyParties and ZhuZhu Pets for providing the new ZhuZhu Pets Ice Cream Parlor and Ice Cream Truck for the kids in our playgroup to try out. Each family also received a brightly colored ZhuZhu Pet to take home. Learn about the latest Zhu-niverse developments at the following ZhuZhu Pets sites: Twitter, Facebook or on YouTube.